Discussing Alzheimer's disease in the Context of Applied Developmental PsychologyDementia is one of the leading causes of mental disorders in the UK and other countries around the world. Alzheimer's is a type of dementia, and it is the most widespread category of the condition (Glenner, 2012). The primary symptom of the Alzheimer's disease is a gradual deterioration of the victim’s memory over time. The disease impairs victims’ lives and causes millions of people to lose their lives every year (Alzheimer's Association, 2013). There is no age boundary for anyone to contract the disease as anyone can be affected by the disease. However, seniors are more vulnerable to the disease than any other age group. Developmental theories such as the Erik Erikson theory, Lev Vygotsky's social development theory, and Jean Piaget's development theory explain the human development phenomenon. Erik Erikson (1902-1994) offers a developmental perspective of the human nature from childhood through adulthood. 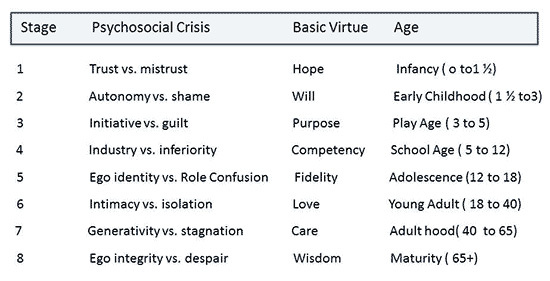 Erik Erikson’s theory is famously known as Theory of Erikson’s theory of Psychosocial Development because it proposes that a human life follows through eight distinctive psychosocial developmental stages as shown below. The other two theories (Lev Vygotsky's social development theory and the Jean Piaget's development theory) explore the role of childhood experiences in human development. This essay explores Alzheimer’s and how it affects human development as per the theoretical language (Erik Erikson theory, Lev Vygotsky's social development theory, and Jean Piaget's development theory). Latest research focuses on the revised criteria of diagnosing the disease as an improvement on the previous standards. According to Jack et al. (2011) and McKhann et al. (2011), the recent recommendations from the National Institute on Aging-Alzheimer's Association include the inclusion of biomarkers of the various states of the disease and formulation of the criteria for each phase of the disease, namely, the dementia, the symptomatic, the pre-dementia, and the asymptomatic stages of the disease. The basic need for this diagnostic review could be the fact that Alzheimer’s requires specific diagnostic criteria to avoid confusing it with other dementia-causing ailments. Biomarkers provide a clear overview of the progression of the disease. For example, a decreased clearance of CNS β-Amyloid is a clear indication of the existence of illness (Mawuenyega et al. 2011). Other researchers such as Dubois et al. (2010) have showcased their interest onto how the characterization of Alzheimer’s can guide the development of a proper cure or, at least, medical breakthroughs to stem the advancement of the disease. Recent research also focuses on the facts related to Alzheimer’s disease. Recent research has shown that Alzheimer’s kills more than 20% of the people age 65 years or older (Alzheimer's Association, 2011). Although the study is reflective of the data collected from the US, it is reflective of the nature of the disease elsewhere. Based on this analogy, one can assume that more than 20% of adults aged 65 years or older are at risk of dying from Alzheimer’s because the disease is common in this age group. However, because the disease also kills 1% others in the 30-65 year bracket are also at risk of dying due to the disease (Sacco, 2013). This means that Alzheimer’s is a serious killer disease for the mid-adult to senior population group and beyond. Alzheimer’s interferes with the healthy development of the children during the trust versus mistrust phase (0-1.5 years). Erikson’s model, the basic and most fundamental element of human development is trust (Gines et al. 1998, p. 24). Children acquire trust or mistrust during the first year or so of their lives. Children who receive stable and consistent care from their caregivers develop trust while children who do not receive consistent package of care and love develop a mistrust of their environments. However, because trust is earned through learning, infants with Alzheimer’s cannot acquire trust because they cannot learn. Infants with Alzheimer’s disease cannot appreciate their experiences with their caregiver because of the memory problem induced by the disease. As a consequence, the child cannot trust anybody because he or she knows nobody. Based on the understanding of the attachment theory, children who lack trust in their caregivers may suffer irreparable damage to their ability to make friends and retain them (Goldberg, Muir & Kerr, 2013). Without an ability to memorize his or her experiences or a capacity to acquire trust, the child cannot learn a spoken language. However, infants are unlikely to suffer from the disease because Alzheimer’s takes years to advance to a dangerous level despite the fact that these children may have the genes that prompt the development of the disease. Alzheimer’s can undermine the child’s ability to acquire the psychosocial competencies that correspond with the autonomy versus shame and doubt development phase. The autonomy versus shame & doubt development takes place between 1 and 1½ years and three years. During this stage, the child develops certain abilities to enhance and achieve individual independence from his or her caregivers. For example, the child begins to crawl and eventually walk away from the caregiver. The child also learns to play with toys and dolls. Shame and guilt are also acquired at this stage. However, a loss of self-awareness and memory that comes with Alzheimer’s disease may undermine the child’s ability to independent. However, 1½- 3-year-olds are least likely to suffer from the disease hence the potential effect of Alzheimer’s on their psychosocial development is hypothetical and least likely to happen. Alzheimer’s can affect the child’s capacity to develop efficiently during the initiative versus guilt stage (3-5 years). During this developmental phase, the child becomes more asserting and aggressive. However, caregivers may make the child feel guilty if they always criticize or control the child. Hypothetically, Alzheimer’s can cripple the child’s capacity to advance in this stage as the child may lack self-awareness and memory. Eventually, the child with Alzheimer’s will not develop the will he needs to grow into an independent person. Alzheimer’s can also affect the proper development of the individual during the fourth stage dubbed the “industry/competence versus inferiority” stage (5-12 years). During this stage, the individual acquires social competency because the peer group will become an integral part of his or her life. The child learns this skill by seeking the approval of his or her peer group and those around him. However, the child may not develop social competency when his or her society appears too demanding. The 5-12-year-olds may not develop the desired social skill or develop a sense of inferiority if they have Alzheimer's disease. However, children up to 12-year-olds’ psychosocial development are least likely to be hampered by Alzheimer’s because the disease does not affect children. However, a child will ultimately suffer the consequences of the disease if he or she becomes a victim before his or her 12th birthday. Alzheimer’s can affect children’s ability to acquire the desired skills during the identity versus role confusion stage (12-18 years). During this juncture, the children become more independent and learn the roles they will occupy as adults regarding family, relationships, family, and housing. However, a lack of positive social stimuli can make the child be confused about the roles he or she would take as an adult. However, if a child has Alzheimer's disease during this stage, he or she will not learn anything because the disease undermines a person’s ability to learn by degrading his or her memory and capacity to think. Alzheimer’s can also affect a young adult’s ability to develop the desired skills during the intimacy versus isolation stage (18-40 years). During this stage, the individual explores relationships with other people leading to a lifetime commitment to other people other than one’s family members. The successful or desired completion of intimacy versus isolation stage often leads to robust and comfortable relationships as well as a sense of commitment, care, and safety within the relationships. However, individuals who avoid intimacy or fear commitment may suffer isolation and loneliness as a result. However, if the person has Alzheimer's he or she cannot enter into intimate relationships because of the disease deprives the individual of his or her ability to remember and think properly. About 1% of the victims of the disease suffer from a mutation-related form of Alzheimer’s (Sacco, 2013, p. 212). The genetic version of the disease can affect someone who is as young as 30 years of age (Bettens, Sleegers & Van Broeckhoven, 2013). This means that the early stages of the disease can start to manifest themselves as soon as during the 31st birthday and progress gradually as one advance in age. The victims of the disease may have difficulties communicating with their spouses or friends, remembering their names and faces, and making decisions based on their experiences. Alzheimer’s will erase all the past mental experiences that the person has had since the trust versus mistrust psychosocial development phases. Thus, individuals cannot develop or acquire the desired intimate skills during the intimate versus isolation period if they have Alzheimer’s disease. Alzheimer’s also affects the normal psychosocial progression during the generativity versus stagnation period (40-65 years). Under normal circumstances, individuals are expected to establish their careers, settle down within their relationships, start or own their own families, and cultivate embrace a bigger picture of themselves in the larger society. In other words, healthy individuals actualize their dreams by starting families, growing their businesses, vying for political positions and embracing philanthropy between the ages of 40 and 65. However, those people who cannot accomplish this expectation suffer from stagnation. However, Alzheimer’s disease can undo the individual’s achievements during generativity versus stagnation phase. Persons in the intermediate adult stage lose the ability to perform simple tasks such as driving and simple arithmetic (Wheatley, Carr & Marottoli, 2014). The victim loses the capacity to remember his or her family members, relatives, friends, and grandchildren. The person living with Alzheimer's also loses the ability to understand whether he has stagnated in life. Thus, Alzheimer’s impairs the victim’s ability to achieve the desired psychosocial development even when they have accomplished many things before their 40th or 48th or 60th birthday. Lastly, Alzheimer’s can have a debilitating effect on an individual who is undergoing through the ego integrity versus despair psychosocial development phase (beyond 65 years old). During the ego integrity versus despair stage, the men and women often reflect on their achievements in life after retirement and use the experiences to develop integrity. However, the men and women who see their lives as unproductive they develop a sense of despair and vice versa. Alzheimer, however, can prevent the males and females at this age to reflect on their achievement and build integrity because the erases their lifelong experiences. During the early stages of Alzheimer’s, the victim might feel hopeless and helpless because of their deteriorating mental functions. However, as the disease advances, the senior citizens might not have any memory that they need to appreciate their past experiences to develop integrity. Vygotsky’s theory is derived from three basic premises. One, the human social interactions influence their cognitive development (Leach, 2015). Two, one’s natural as well as cultural development does not happen in isolation (Leach, 2015). Three, language plays an important (major) role in one’s cognitive development (Leach, 2015). The most important concept of the Vygotsky’s model is a zone of proximal development which refers to the time of learning where the more knowledgeable other (the MKO) assists the learner in developing a higher degree of learning. The MKO’s objective is to be as less involved in learning as possible as the student or individual becomes more independent problem solver or thinker with time. Vygotsky also argued that each activity in a child’s cultural advancement presents itself twice: first, on the individual’s cultural development manifests itself on a social level and the personal level, beginning with people and then among people and then inside the person (Lantolf, Thorne & Poehner, 2015). This affects things like logical memory, formulation of concepts and voluntary attention. That’s all the higher human capabilities and functions emanate from the actual relationships among people. Alzheimer’s disease can affect the individual socio-cultural development from all angles. By killing the person’s memory and capacity to lead independent lives, Alzheimer’s disease undermines one’s socio-cultural development. The disease also undoes the acquired knowledge and experiences thereby making the individual dependent on other people. Piaget’s theory explains how people develop or acquire knowledge. According to Piaget’s model, children (or people) acquire knowledge through four stages, namely, the sensorimotor stage (0-2 years), the preoperational stage (2-7 years), the concrete operational phase (7-11 years), and the formal operational stage (12-adulthood) (Huitt & Hummel, 2003). During the sensorimotor phase the child acquires knowledge through manipulation of objects and sensory experiences. During the preoperational period, children learn things through pretend play but face challenges with taking other people’s points of view. At the concrete operational phase, the child begins to think more logically, but his or her thinking is sometimes very rigid. Lastly, the formal operational period the individual has an increased logic, understanding of abstract thoughts and ideas, and uses deductive reasoning. Alzheimer’s disease affects people’s formal operational period only because children do not have Alzheimer's. A typical adult depends on schemas to make sense of the world and ideas in his or her mind. However, Alzheimer’s disease erases the brain’s capacity to utilize the schemas. The disease also undermines memory thereby making it impossible for someone to use past experiences to make sense of the present situation. In most instances, people with the disease behave like children or posses childish behaviours (Thornbury, 1993). This is because the disease reverses the life-long knowledge and experiences that the victim’s have accrued. Thus, the person living with Alzheimer's loses the cognitive capacity to live a normal life. Alzheimer’s is a costly medical issue in the UK and other countries around the world. Dementia (which includes Alzheimer’s and other conditions) cost approximately $604 billion in 2010 (Wimo et al. 2013). The net cost of the disease includes, but not limited to, loss of employment, dependency, medication, and other consequential costs. However, the monetary cost of the disease may not surpass the social impact of the disease. For example, the cost of losing a loved one to the disease cannot be quantified. Equally, the emotional cost of having to care for a friend or a loved one who has lost a sense of self or memory cannot be evaluated regarding US dollars. People with Alzheimer’s disease often behave like small children and this can be extremely stressful to the caregivers and family members (Thornbury, 1993). There is an urgent need for people to receive education about the nature and veracity of the disease to help people and families appreciate how to live with the disease. Many people have heard of Alzheimer’s but may not understand the symptoms and development of the illness per se. Some may confuse Alzheimer’s with NPC (Niemann-Pick disease type C) that attacks children because NPC resembles Alzheimer’s, but it has nothing to do with Alzheimer’s disease (Bushark, 2016). The public also needs to appreciate how to manage the disease, which includes medical options available. Alzheimer’s has no known cure, but various medications can help the victims to minimize its symptoms. Examples of such drugs include Donepezil, Rivastigmine, and Galantamine. The medicines and education are what makes the disease expensive. Alzheimer’s is a serious health problem for many people in the UK and elsewhere. The disease affects millions of adults by undermining their psychosocial development. Erik Erikson, Lev Vygotsky's social development, and Jean Piaget's development theories help us understand how children develop their socio-cultural aspects, their social skills, and cognitive skills, respectively. Children and young adults (0-30 years) are not likely to suffer from the disease as the disease mainly affects people over 65 years, but less than 1% of the victims may be 30 years to 64 years. The government policy towards the Alzheimer’s disease should improve. At the moment, little has been done to improve the welfare of the people living with the disease. The government needs to fund more research to investigate viable treatment option for the disease. Alzheimer's Association. (2011). 2011 Alzheimer's disease facts and figures. Alzheimer's & dementia: the journal of the Alzheimer's Association, 7(2), 208. Alzheimer's Association. (2013). 2013 Alzheimer's disease facts and figures. Alzheimer's & Dementia, 9(2), 208-245. Bettens, K., Sleegers, K. & Van Broeckhoven, C. (2013). Genetic insights into Alzheimer's disease. The Lancet Neurology, 12(1), 92-104. Bushark, L. (2016). What is ‘childhood Alzheimer’s’? New Treatment offers hope to teens with rare disease. Medical Daily. Retrieved fromhttp://www.medicaldaily.com/childhood-alzheimers-niemann-pick-disease-372960"
Dubois, B., Feldman, H. H., Jacova, C., Cummings, J. L., DeKosky, S. T., Barberger-Gateau, P., ... & Gauthier, S. (2010). Revising the definition of Alzheimer's disease: a new lexicon. The Lancet Neurology, 9(11), 1118-1127. Glenner, G. G. (2012). Reprint of “Alzheimer’s disease: Initial report of the purification and characterization of a novel cerebrovascular amyloid protein.” Biochemical and Biophysical Research Communications, 425(3), 534-539. Gines, A. C. , DIZON, P. B., Obias, P. H. R., Uriarte, G. G., & Vendivel, F. G. Jr. (1998). Developmental psychology. Manila: Rex Book Store, Inc.
Goldberg, S., Muir, R., & Kerr, J. (2013). Attachment theory: Social, developmental, and clinical perspectives. London: Routledge. Huitt, W., & Hummel, J. (2003). Piaget's theory of cognitive development. Educational psychology interactive, 3(2), 1-5. Jack, C. R., Albert, M. S., Knopman, D. S., McKhann, G. M., Sperling, R. A., Carrillo, M. C., ... & Phelps, C. H. (2011). Introduction to the recommendations from the National Institute on Aging-Alzheimer's Association workgroups on diagnostic guidelines for Alzheimer's disease. Alzheimer's & Dementia, 7(3), 257-262. Lantolf, J. P., Thorne, S. L., & Poehner, M. E. (2015). Sociocultural theory and second language development. Theories in second language acquisition: An introduction, 207-226. Mawuenyega, K. G., Sigurdson, W., Ovod, V., Munsell, L., Kasten, T., Morris, J. C., ... & Bateman, R. J. (2010). Decreased clearance of CNS β-amyloid in Alzheimer’s disease. Science, 330(6012), 1774-1774. McKhann, G. M., Knopman, D. S., Chertkow, H., Hyman, B. T., Jack, C. R., Kawas, C. H., ... & Mohs, R. C. (2011). The diagnosis of dementia due to Alzheimer’s disease: Recommendations from the National Institute on Aging-Alzheimer’s Association workgroups on diagnostic guidelines for Alzheimer's disease. Alzheimer's & Dementia, 7(3), 263-269. Sacco, R. G. (2013). Re-envisaging the eight developmental stages of Erik Erikson: The Fibonacci Life-Chart Method (FLCM). Journal of Educational and Developmental Psychology, 3(1), 140. Thornbury, J. M. (1993). The use of Piaget's theory in Alzheimer's disease. American Journal of Alzheimer's disease and other dementias, 8(4), 16-21. Wheatley, C. J., Carr, D. B., & Marottoli, R. A. (2014). Consensus statements on driving for persons with dementia. Occupational Therapy in Health Care, 28(2), 132-139.Wimo, A., Jönsson, L., Bond, J., Prince, M., Winblad, B., & International, A. D. (2013). The worldwide economic impact of dementia 2010. Alzheimer's & Dementia, 9(1), 1-11.